Many people have discovered that quieting their minds through meditation greatly enhances their health and performance, some find it difficult to completely relax into a sitting or silent meditation. Their minds wander, they lose their concentration and they may become discouraged by the process. Tai Chi, often described as meditation in motion, is ideal for those who find it difficult to meditate or find Yoga to be too strenuous. It involves a series of movements performed in a slow, focused manner and accompanied by deep breathing. Because the practice requires performing a series of rhythmic patterns of gentle movements, the mind can focus solely on the forms. The entire body is always in motion during Tai Chi, which seeks to improve the flow of the body’s vital energy known as qi (pronounced ‘chee’). Another of its philosophies is that in strengthening the body, the mind will be strengthened as well. It also teaches the body to recognize harmony, to recognize the balance between the principles of Yin (cold, wet, contracting, feminine) and Yang (hot, dry, expanding, masculine). 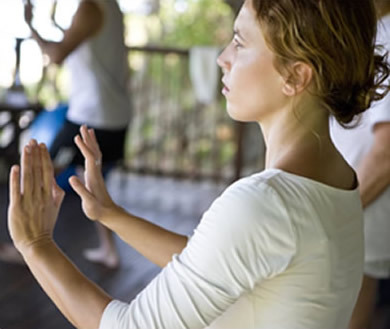 In addition to mental relaxation, Tai Chi is being studied for its health benefits. For example, the practice may have the ability to help the body recuperate from the pain and fatigue associated with chemotherapy and radiation in cancer patients. A study at Tufts-New England Medical Center in Boston found that benefits from Tai Chi were reported in improved balance and strength, cardiovascular function, respiratory function, flexibility, improved immune system, relief from symptoms of arthritis, improved muscular strength, and improved psychological effects such as mood. Tai chi is low impact and puts minimal stress on muscles and joints, making it generally safe for all ages and fitness levels. In fact, because tai chi is low impact, it may be especially suitable if you're an older adult who otherwise may not exercise. It is also beneficial for anyone who has a stressful lifestyle and needs better balance and tranquility of the mind and emotions. 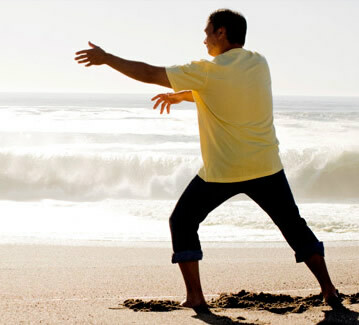 Tai Chi is easy to incorporate into daily life as it requires no special equipment and can be done both indoors and out. It is also ideal for someone who wants to explore demanding routines such as Yoga or needs something more basic to get back in shape. Try your first class for $5. Getting started is easy, relaxing, and fun. Complete the form below or call us at 201.520.0211 to register.